Tag line: "Descend into worlds with no light, no air, and no room for error"
After watching the 2001 IMAX film Journey into Amazing Caves, it’s clear that “caving” (another name for spelunking, or the exploration of caves) is one of the most exciting extreme sports. And from the looks of it, it’s also one of the most dangerous. Narrated by Liam Neeson, Journey into Amazing Caves follows two women: cave rescue instructor and 2nd-grade teacher Nancy Aulenbach and microbiologist Hazel Barton, as they explore a trio of caves, each more thrilling than the last. We begin in Arizona, where our two researchers, along with their male cohorts, repel 300 feet into a crevice in heat well over 100 degrees Fahrenheit. From there, it’s off to Greenland, where the glacial caverns offer yet another challenge. After surviving both the heat and the cold, Nancy and Hazel next head to Mexico’s Yucatan Peninsula for their greatest challenge yet: caves that are flooded, and can only be fully explored by suiting up and diving into them. While these expeditions are certainly exciting, Nancy and Hazel are looking for more than just thrills; they’re after “extremophiles”, microscopic organisms that survive in the harshest conditions, which might hold the key to curing certain diseases. At times, Journey into Amazing Caves is, well…. amazing, capturing beautiful images of underground caverns that, in all likelihood, have never been visited before (rock formations in the Arizona caves, situated within the Grand Canyon, are stunning and even a little eerie). More than this, though, the film reveals just how daring one must be to be a cave explorer. In Greenland, the ice found deep within these caverns can be volatile, sometimes splintering off into 10-ft spears, which, as you can imagine, could make climbing down into them a bit treacherous (things are so dicey that, at one point, the guide tells Hazel and Nancy not to come down any further). Yet it’s the dive that Hazel and a male companion make into the flooded Yucatan caves that’ll really put you on the edge of your seat (cave diving is so dangerous that Nancy promised her family she’d never attempt it). The issue, of course, is that you never know what obstacles might be waiting for you, and if you lose track of where you are, or get stuck, you could run out of air before you swim your way back to the surface (in one harrowing scene, Hazel squeezes through an opening no wider than she is). 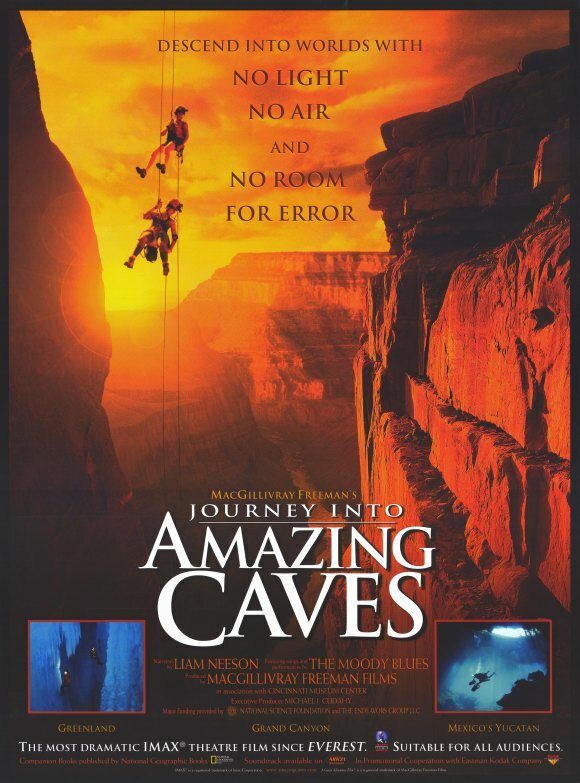 As it is with many IMAX films, Journey into Amazing Caves chronicles some extraordinary adventures. But unlike the locales in Wild Australia: The Edge or Kilimanjaro: To the Roof of Africa, I have no desire to visit any of these caves myself, and am perfectly happy experiencing it all from the safety of my living room.